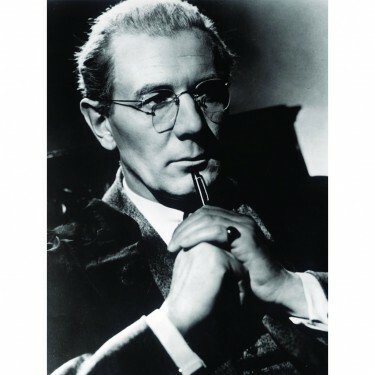 This is one of my all time favourite films with Michael Redgrave giving a wonderfully moving performance as schoolmaster Andrew Crocker-Harris – from the Terence Rattigan play. It is a touching story of how the confidence of an elderly and unsuccessful schoolmaster Andrew Crocker-Harris is restored through affection of one of his pupils and the friendly advice of other teachers. This is regarded with some justification as Terence Rattigan’s best serious achievement in the theatre, and this film adaptation manages the transition to the screen very well. The Film is, quite rightly, dominated by Redgrave’s brilliant performance as the prim, ailing, seemingly unlikeable schoolmaster, a beautifully written part, played with technical mastery and finely controlled feeling. 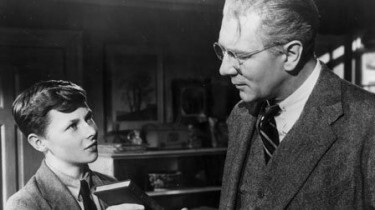 Michael Redgrave is completely and touchingly convincing as the pathetically unsuccessful and cruelly treated schoolmaster – a memorable figure and a memorable piece of acting. Jean Kent is alarmingly credible also as his wife, selfish, snobbish and repulsively possessive – this is not giving her any redeeming features at all – however in the dialogue Crocker Harris justifies his wife’s behaviour and says that when they married they had both required a different form of love from each other and as the years went by he had hoped that they would grow closer but in fact those differences had become magnified and had torn them apart. Jean Kent didn’t get many parts in her career as good as this one. Nigel Patrick is the wife’s repentant lover and Wilfrid Hyde White plays the unctuously amiable Headmaster. Brian Smith plays Taplow the schoolboy whose gift of the Browning Version of the Agamemnon deeply touches Crocker-Harris. Above: Taplow gives a copy of the Browning Version of the Agamemnon to Crocker-Harris. Interesting to see that Terence Rattigan actually wrote the screenplay for the film adapting it from the stage version. It was made in 1951 and Directed by Anthony Asquith. I do remember Robert Morley saying that Asquith was always referred to as ‘Puffin’ – he didn’t know why though BUT he did say that he always directed his films dressed in a Boiler Suit. His greatest films were Pygmalion, The Way to the Stars, The Winslow Boy, The Browning Version, and The Importance of Being Earnest - although there were many more. The Winslow Boy made in 1948 was, of course, from another Terence Rattigan play. The Browning Version was shot at Pinewood Film Studios and the school exteriors were filmed on location at Sherborne School in Dorset. 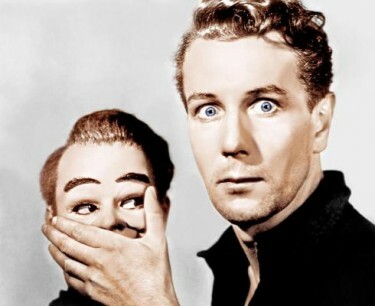 Dead of Night – couldnt resist putting this film still in – this shows Michael Redgrave in a segment of the film Dead of Night – and I have to say that this story about the ventriloquist is probably the most frightening I have ever seen.